Halogen Headlamps - The new 124 Spider Roadster comes with halogen headlamps that provide maximum vision in the dark or adverse weather conditions. These headlamps were designed to produce a wide light pattern spread, allowing the driver to see more of the road. LED Taillamps - The FIAT Roadster comes with LED taillamps that emit a bright and clear light, making it easier for other drivers to see you. These LED taillamps were specifically designed without a filament. This makes them more long-lasting and less susceptible to breakage, providing you with longer use. Interested in seeing the FIAT 124 Spider Roadster for yourself? 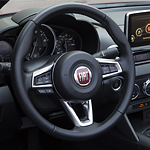 Come and visit the FIAT sales team at Lithia Auto Stores and test drive one today.